This article is a follow up to the articles about Placebo Effect published in issues #1 (https://www.scienceofmassage.com/2018/05/the-placebo-effect-and-its-role-in-massage-therapy-part-i/) and #2 (https://www.scienceofmassage.com/2018/08/the-placebo-effect-and-its-role-in-massage-therapy-part-ii/) of JMS. Originally, we thought to publish this article as one piece, but it grew in size and to make it reader friendly we decided to split it in two parts as well. The goal of this and Part II of this article is to discuss how the patient’s brain reacts to chronic pain, what mechanisms it uses to protect itself from stress and exhaustion, how to recognize these mechanisms and how to turn the tables around to overcome psychological obstacles which greatly affect treatment outcomes. The brain of every patient with chronic pain must deal with its constant bombardment by chronic noxious stimuli while continuing to function and control vital body functions. To protect itself the patient’s brain may use one or two available protective psychological reactions. Six of them very frequently may be observed in patients with chronic somatic pain: anger, regression, hypochondria, denial, projection and rationalization. The brain of each patient with chronic pain, in different degree, employs these protective mechanisms to ease the level of stress developed secondarily. We will discuss each of these protective mechanisms on the examples of patients from our clinic. We will also suggest the therapists’ behavior patterns to combat these psychological protective reactions. Sometimes even the wrong tone of voice or incorrect interactions may reinforce an already established wrong behavioral pattern, reinforcing already existing chronic somatic or visceral abnormality. Thus, the initially tangled relations between therapist and patient visually presented in the picture below must be untangled while therapy moves forward. Such an unfortunate position is a grave mistake. We in SOMI strongly believe that therapists are making a professional mistake by trying to treat only somatic abnormalities, completely disregarding the psychological component of the chronic pain. Neither psychologist nor psychiatrist is present in the therapy room and can assist patients and therapist. In such case, it is the therapist’s direct responsibility to consider the psychological component of the somatic pain he or she addresses. Thus, to achieve stable clinical results and treat the patient’s whole body instead of one pain syndrome, therapists must understand how the brain is able to deal with chronic pain. It doesn’t matter if you’re a massage therapist, physical therapist, chiropractor, dentist or physician. We all MUST consider the psychological component of our therapies since if we don’t engage the patient’s brain correctly and don’t involve it into the treatment process, wrong established patterns of behavior ruin the treatment process. Also, it would be a great mistake to see all patients with protective reactions as ‘crazy’. Each of us can be in their place if we suffer from chronic pain long enough with no light at the end of the tunnel. Of course, this ‘long enough’ differs from patient to patient. An additional factor reader should consider is what happened with the patient after the therapist finished and helps him or her with let’s say lower back pain. In many cases the psychosomatic component which wasn’t addressed during the therapy may bring the same symptoms back despite that the initial therapy was successful. In these cases, the patient will always look for other treatment options despite that the therapist did everything correctly, but he or she didn’t address the psychological component of chronic pain the patient developed. When I was talking about the psychological component I didn’t mean psychological therapy, but rather, individually adopting the therapist’s behavior to each patient while conducting necessary treatment. 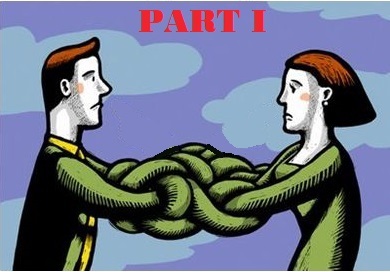 Thus, starting with the first meeting, the therapist must clearly understand the major patterns of the behavior exhibited by every patient with chronic pain and establish communication lines without enforcing existing protective reactions the brain has already developed. Let us illustrate how patients with different protective reactions behave and what to do about it. To better illustrate the concept, we took the most expressive cases from our clinic. These cases are illustrations and despite that they are fitting into discussed behavioral profiles the solution we suggest for each case is our personal experience to deal with patients’ protective reactions. A 65 year-old retired man came to our clinic with a clinical picture of frozen shoulder which he developed during the previous four months. The evaluation confirmed the presence of a very advanced Adhesive Capsulitis with severe restriction of active and more important passive movements in the shoulder joint (20% of passive abduction and 10% of active abduction). The severe restriction of passive movements indicated non-complaint contracture which is extremely difficult to treat, especially in the shoulder joint. The patient was very angry, upset and couldn’t stop talking how much time and money he spent while going through different therapies while his symptoms steady worsened. The final solution which was offered to him was active manipulations of his shoulder by an orthopedist while he was under anesthesia and if that failed a shoulder replacement should be considered. Without going into a discussion of his symptoms it was obvious that Medical Massage would probably solve his problems, but it would require time and repetitions. However, the anger the patient clearly exhibited was a major obstacle since he would see our intervention as another way someone tries to make money on his shoulder problems without any results. The patient has a legitimate right to be angry because of how long and how unsuccessful his therapies were. However, his anger had some pathological bitterness. In small details he described what his PT, DC and MT did, and it was accompanied by almost degrading comments about the people who worked on him. It wasn’t just general anger he clearly exhibited, but also anger as a protective reaction developed secondarily to his long suffering. His anger must be channeled into something positive and productive. There were two directions in which we needed to channel his anger: dedication to therapy and intensive homework between sessions to maintain pressure on the system and restore functions. First, we needed to get through his defenses. Saying that everyone tried to help him as best as they could wouldn’t fly since he would immediately see our clinic as ‘one of them.’ At the same time a critique of fellow health practitioners wouldn’t do any good either. Instead we started to get his attention by critiquing the medical system in general and the way it operates. Such critique is acceptable because it is faceless. We told him a couple negative experiences with insurance medicine from our clinic and as soon as his attention was switched from particular health practitioners, which he blamed for worsening of his symptoms, to the general topic, he became very engaged and it became obvious that now we had a chance to get through. Next, we offered him the following deal. No money paid for therapy until he starts to see first signs of improvement. In return he must dedicate all his free time for homework between sessions and be a patient. The plan immediately impressed him and he agreed. The patient started to notice first improvements after 6 sessions. Starting from 7th session while he continued to improve he began to reimburse our services. At the end of the treatment when shoulder functions were restored he insisted and paid us for the first 6 sessions as well. Regression is a protective reaction of the brain when the patient starts to behave and act as a child. By doing that the patients ease their stress level by trying to trigger sympathy from people around them. A 46 year- old woman works as a registered nurse. She suffers from long lasting chronic headache and neck pain. She also developed severe anxiety which got worse with each flare up of headache. Her anxiety was so bad that it triggered various visceral abnormalities: palpitation, increase of respiratory rate (tachypnea), nausea with vomiting, etc. Recently she was in the ER monthly and sometimes two times per month. Regression is the easiest protective brain reaction to overcome since the patient is already looking for people who are willing to take care of them. From this perspective it was an easy case to handle. After clinical evaluation, we gave her a piece of paper and a pen and dictated everything she must do at home. Initially she wanted to type it in her iPhone, but we insisted on handwriting. This way we could trigger her dedication by re-creating her younger years in a school setting. Thus, it was important that she wrote it down by herself. Every session we started with her reporting how she felt, what she did to help her headache and neck pain. All interactions with her were done with a teacher’s attitude and voice. After headache and cervical pain were under complete control the entire regressive behavior was gone. She was acting now as any other 46 year- old woman should with full engagement into her work as a registered nurse. Technically speaking, Hypochondriasis is an independent and very debilitating disease. Those patients developed an inaccurate perception of various diseases formed in their body or mind or both, despite the absence of an actual medical problem. Therapists as well as other much more qualified health practitioners usually fail to help these patients. Usually Hypochondriasis is present for years without any light at the end of the tunnel. However, some patients with chronic pain may exhibit hypochondriac type of behavior which started after they developed the initial symptoms. In these cases, it is another form of self-defense the brain employs to deal with chronic pain. The difference between real hypochondriacs and those patients who exhibit hypochondriac type behavior is that the second group is actually looking for help while real hypochondriacs visiting any health office is a way of life. The simple distinction is the absolute absence of even minimal improvement for the real hypochondriac and absence of any cooperation for homework. At the same time patients with hypochondriac type behavior will notice it and inform their therapists about any clinical improvements. A 32 year- old very intelligent woman came to our clinic with complaints about a severe migraine-type headache she developed in last 2 years. She is a computer programmer and was forced to quit her job a year ago due to intense headaches which flare up after hours of computer work. First what she did was pull a two-inch-thick file of her medical records and prints from WebMD. The conversation with her looks like an endless chain of theories which she developed based on Internet research as to why she has a headache and why nothing helps her. Clinical evaluation showed that she is 100% our type of patient and we will be able to decisively help her since she exhibited all the signs and symptoms of Greater Occipital Nerve Neuralgia. However, if we say to her, “Don’t worry, we will take care of your headache in 4-5 sessions,” (which was actually true) there was a good chance that she would never come back to our clinic, thinking that we were practicing quack medicine. Her mind was already made up that something more serious and dangerous happened to her and no one simply was able to figure it out yet. One of her ideas was that she has this constant headache because of her childhood cardiac problem. Her foramen ovale (opening between both atrias) was the trigger for her headache. Yes, it is medical fact that a not fully closed foramen ovale may later in life manifest itself as migraine-type of headache, however in her case the opening was completely closed in her early years. Simply dismissing the patient’s theories including ‘cardiac theory’ was completely counterproductive since it was exactly what other health practitioners including her PCP did. Instead, after clinical evaluation we asked her to leave her file and let us go over it in detail later and re-schedule her evaluation appointment one more time with no charge. The suggestion really surprised her since apparently no one even made an attempt to look into her carefully arranged file of Internet prints. Quick examination of the papers in the file showed that all data she collected had nothing to do with her problems. At the beginning of the next session we expressed deep gratitude for the file she brought in and we acknowledged that indeed her headache was a very serious puzzle. We suggested she try some tools Medical Massage offers and we emphasized that since her problem is very complicated we expected just reducing the intensity of her symptoms while in reality we expected complete elimination of her headache. She agreed with great enthusiasm since even the possibility of partial relief of her headache’s intensity was great news. We insisted that to better help her we needed her active engagement with homework which she needed to do between sessions. We also emphasized that we needed her to start a little diary to write how she feels after each session and between sessions. It was obvious that the patient was excited with this offer. She came back after the first session and it was obvious that something positive happened. She had a very intense flare up of her headache on the next day which continued to the day after (we informed her about such possibility at the end of first session), but the morning at the day of the second session she noticed some improvements. It was exactly what we expected. At this point she pulled out her notebook where she wrote in detail all her symptoms on an hourly basis starting with the hour after the first session! There were pages of meticulously taken notes! I took time to read all of them despite that they didn’t make any difference in the treatment plan. It was obvious that the patient carefully watched as I turned page after page until got to the very end. As soon as I finished I told the patient that these notes are an exceptional help since they now guided me to formulate a better treatment plan. As I planned, her headache was under complete control after approximately 6 sessions of Medical Massage protocol for Chronic Headache. She stayed on supportive monthly sessions for four months before we completely discharged her from the clinic. After one of the monthly sessions she said that she had a personal question to ask. I answered, “Of course!” Her question was, “You knew everything from the very beginning and you didn’t need all my notes, did you?” I answered, “Your notes made a huge contribution to the therapy and we never would have succeeded without them.” She is completely headache free for more than a year. In Part II we will discuss clinical cases of remaining protective mechanisms developed by the brain due to chronic pain – denial, displacement, and rationalization.